A great many of the projects Lockit-safe have been working on in recent years have been for the rail sector. There is a commitment from Transport Organisations and Rail Operators to improve the amount and quality of cycle parking at rail stations,in order to encourage more people to take their bikes and ‘ditch’ their cars. With the number of cars on our roads leading to peak-time congestion, there is a growing recognition of the vital role that rail plays in solving local transport problems. With increased rail traffic, however, comes a potential congestion point at rail stations with more cars dropping off, picking up and using the car parks. Traffic congestion, overflowing car parks and difficulties accessing stations can put people off using rail, which will not help the move towards less cars on our roads and more sustainable travel. It has been recognised that rail stations need to be made more accessible to both foot and cycle passengers in order to improve people’s perceptions of train journey convenience and reliability. Many stations were not built to cope with the amount of traffic they now generate and this can cause conflict between cars, cyclists and foot passengers. The biggest challenges for cyclists are often the last half mile, where traffic and urban development are often at their densest. In addition, station forecourts often prioritise cars with drop off areas and car parks close to the entrance. The amount and quality of cycle parking at stations has been receiving investment over recent years and this trend is due to continue. Without enough high-quality cycle parking, commuters will be put off leaving their valuable bikes. 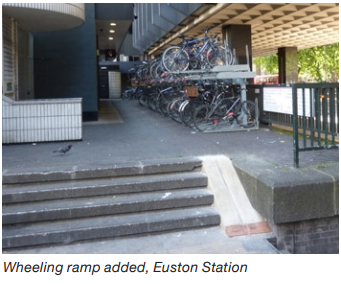 According to Sustrans, “A particular area of focus needs to be at major stations in London where cycle parking needs to keep pace with rapidly growing demand and achieve European levels of provision” Cycle & Rail Integration 2014. The government has recognised this need and there has been significant investment in the improvement of rail stations, much of which has been focussed on the improvement of cycle parking facilities for rail passengers. Lockit-safe have been working with rail companies across the UK for many years and in recent years have seen a number of key trends appearing. Stations often have restricted options for space, trying to fit their cycle parking into tight spaces in old buildings and areas. For this reason, two-tier cycle racks are often the cycle racks of choice as they allow twice the amount of cycle parking spaces for the same footprint as a traditional bike rack. Two tier cycle racks are often used in conjunction with other cycle parking options, such as simple Sheffield stands to provide a number of cycle parking options, with the two tier perhaps being part of a paid for service. Cycle Hubs are becoming increasingly popular as they provide a highly secure cycle parking option for passengers. 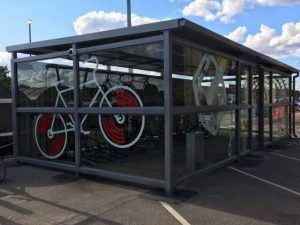 Unlike traditional cycle shelters or compounds, bike hubs generally have access control and provide additional services for the user such as changing facilities, kit lockers, public cycle repair stands and even cycle retail outlets.